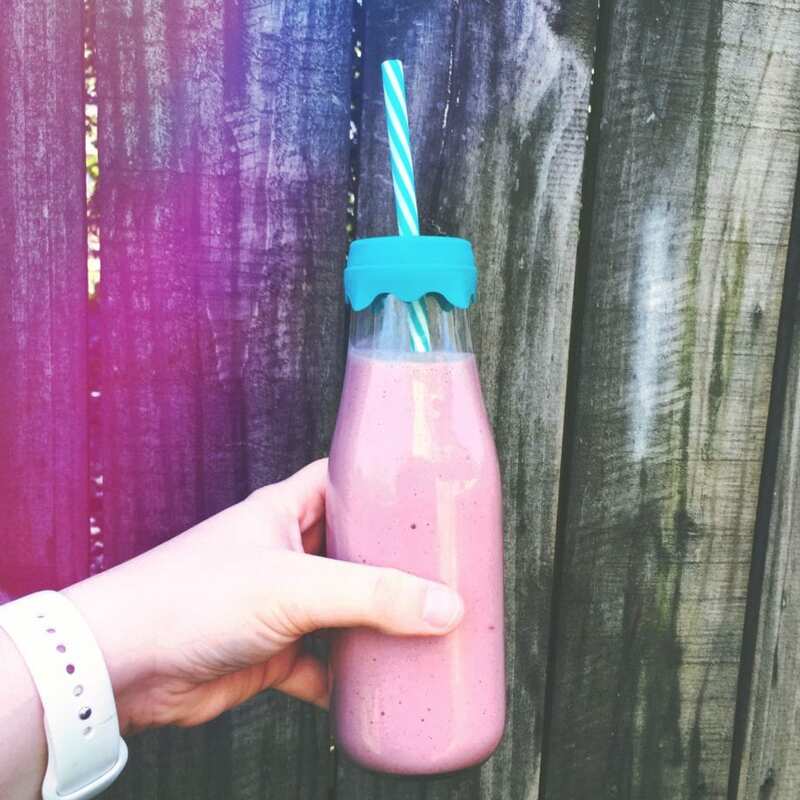 This Peanut Butter and Jelly Smoothie is my all time favorite! It tastes just like munching on the sandwich. Plus, you can't go wrong with PB&J, like ever! I started making it a few years ago when I discovered dried peanut butter. It's so simple to make, and I add a kick of protein to mine to make it a meal replacement or an afternoon snack. The basics of this smoothie are simple. Dried peanut butter, frozen strawberries (or fresh but frozen makes it colder), and your favorite milk, I prefer almond milk. But to make this a protein packed smoothie I like to add in some Stonyfield Greek Yogurt (Plain or Vanilla) and some The Healthy Skoop Vanilla. (I know I have chocolate pictured here, but I had a small sample pack from the Natural Product Expo in vanilla) Healthy Skoop is gluten, whey, soy, and dairy free. It is also Certified Organic so no GMO's or funky stuff either. 20 grams of organic brown rice, pea, and hemp come together to create a complete protein with a complete amino acid profile. 50% of your recommended daily intake of vitamins and minerals from whole foods so that your body can actually absorb them! 1 billion probiotic organisms aid digestive health + 1 gram of prebiotic fiber to nourish healthy gut flora. This stuff has it all! But the best thing about Healthy Skoop is the mission they have. For every serving of Skoop sold, Healthy Skoop donates one serving of free fresh fruits and veggies to a school lunch program in America. Layer your smoothie in the order of the ingredients to optimal blending. I am a Stonyfield Blogger, all opinions are my own!